Hazel wanted us to tell you all that her Auntie Apryl has received some very good news about her recent battle with brain cancer. Her tumor has shrunk to a manageable size and she is being discharged from Hospice this coming Monday. 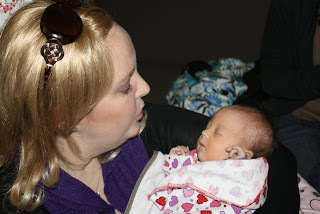 Auntie Apryl will return home to live with her husband, Mike, and gorgeous little angel Allie Belle, who is 1 year old. Although the tumor is not gone completely, the doctors are very pleased with the outcome of her treatment. They are hopeful that they can manage the tumor by closely monitoring it. We are all amazed with her progress. Back in November she was given 3 to 6 months to live and here she is defying the odds once again. Hazel is very proud of her Auntie for facing this challenge with a positive attitude and devotion to her little girl. We are all so happy and relieved that Apryl is going home to live her life as a healthy mommy, wife and friend. We can't wait to come home and start our new lives together with our daughters!!! We are all so proud of you Apryl!! !